When someone says, "be yourself" do you immediately freeze? It's okay not knowing who you are. Take Carol Danvers AKA Captain Marvel, for instance. She's a superhero, first Avenger, and an overall tough cookie but she was very confused at one point. She wasn't aware of her true self for a very long time but it helped to learn about herself. It showed her the truth and shaped her future. (Good for you, Carol!) She was able to see through Yon-Rogg's phony facade and manipulation to help the Skrull race protect the Tesseract. Now, the illustrious Captain Marvel has amassed a long list of accomplishments! Suit up in the blue, red, and gold jumpsuit and become one step closer to knowing who you are. 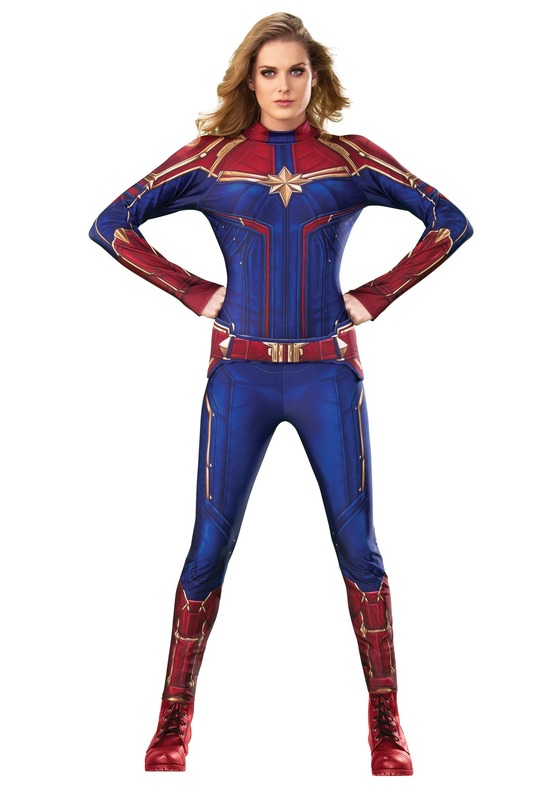 Knowing your true self doesn't always involve photon blasts, absorbing energy cores, or guarding an entire extraterrestrial (thank goodness) but this costume can provide you with the power to look inside yourself so you can reach your full potential too, just like Captain Marvel! Now feeling like you belong to the Marvel Cinematic Universe is possible thanks to the officially licensed women's Deluxe Captain Marvel costume. The mock neck style jumpsuit is stretchy, comfortable, and printed to look like Carol Danver's Starfleet suit, featuring a golden star in the center with a utility belt accessory at the hips. Strike a fierce pose while you're wearing it and stay true to who you are! Make your Captain Marvel costume higher, further, and faster with a few key accessories you can get right here! Add some sparkle and shine with a Captain Marvel necklace and earring set or, give your final look an authoritative touch by including a pair of gloves to complete the look then pretend like you're throwing a proton blast.